I’m predicting that Monday, February 8th is going to be cold and miserable. I think I’ll want soup for lunch, just to warm me up. 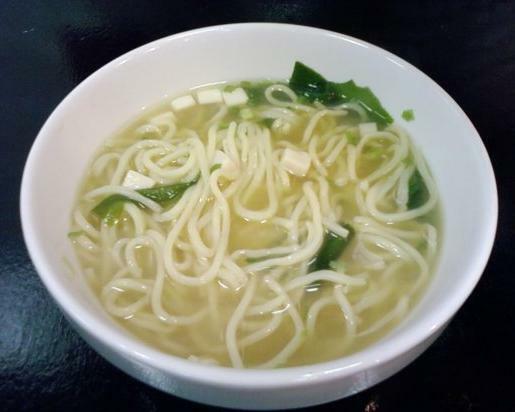 I’ve already made plans to go to Ba Doy Ow, my favorite Taiwanese restaurant in Flint to have miso soup. Actually, it’s the ONLY Taiwanese restaurant in Flint, but let’s not split hairs. Grab a quilt and come along. You are all invited! Yi-lan has extended the “Take Your Quilt To Lunch Special” to include our visit on February 8th. And I’m bringing a very special quilt to present to a very special person that day at Ba Doy Ow. Please come and join me for lunch and for the quilt presentation. If you don’t like miso soup, there are lots of other delicious things to pick from on the menu. If you don’t want to drive in from Colorado, well…. I understand. We’ll miss you! Entry filed under: Quilting, Quilting News. Now, that is a great idea, and you actually got to do it!!! Will definitely be with you in spirit, although it’s a long way from Texas to Michigan. Enjoy! Honestly, you and my sister are the only real reasons I would want to move back north to Michigan . . . wish I could join ya’ll on Monday for soup and silliness, but I’d never make it back to my desk in time. I’ve been told red beans and rice is a New Orleans special “soup”. I”ll be celebrating too. Won’t be driving from Oregon to join you all though. Have a fantastic bowl of Miso Soup and quilt share. That Miso soup looks a lot more filling than the Japanese Miso soup! In fact, that almost looks like saimen……….and you now have me drooling. Will be having minor surgery on Monday, but will be there in spirit. I really want to come, believe me, but the trip from Gainesville, FL is a problem. Gas is so expensive! Sounds wonderful!! BUT – I’m afraid I’ll be snowed in here in Virginia – for the third time in 2 months. Guess I’ll just have to make a pot of soup and sit by my logs with my quilts. I’d love to come, but…Wyoming is just a tad too far! I hope you understand. It isn’t as far as Colorado, but almost! Sorry, miso soup is off my list of foods I can eat. But enjoy it for me please. Can’t make it from Oregon, either. But enjoy a bowl for me too. It sounds like a lot of fun. Wish I could come! Please post a photo of the quilt presentation, for those of us who are nosey but not able to be there. Ami’s “celebrations” are always fun!!! Sounds like fun. Wish I lived closer. We are getting snow and there is a lot of snow and ice between me and Flint. Maybe after the spring thaw!!! Oh my – I wish I could but I have a JOB interview that day. Have an extra schhhlurp on me! OOOOOOOOO! Miso soup sounds so good. The distance from West Palm Beach, FL is all that stands in my way! Enjoy and let us know how the day goes. Maybe I can go to a local Taiwanese restaurant and join you vicariously. Mary, you and my friend Lucy should meet – if you haven’t – she wrote me all about the Buddy parade with 8000 men all wearing dresses to celebrate the Saints’ victory! She has shared some of her recipes with me and they are Dee-Lish-Uss. That “very special person” is getting a very special quilt! Hope someone remembers to bring a camera that day. And yes, sorry, it is too far to drive back from Colorado Have an extra of those steamed, stuffed yummy balls (can’t remember their name) and raise your needles to salute all the AAQI quilters. I would love to join the fun but will be in Colorado welcoming home a son from Afghanistan. Have some soup for me. The weather is still nice right now in Colorado…Not that I wouldn’t love to come see the quilt presentation… Have a nice lunch party and enjoy some soup for the rest of us!